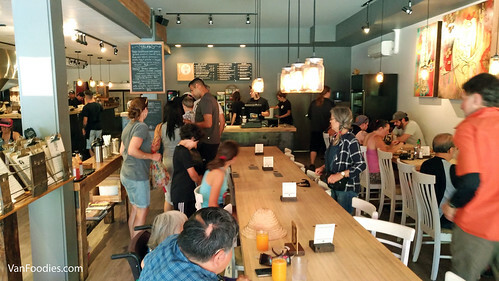 The Vancouver Fish Company has opened its door since September 2014. 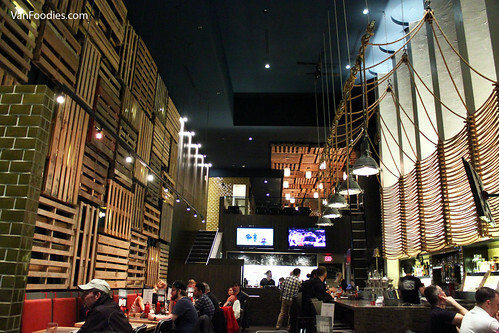 Located right at the entrance of the Granville Island, this seafood restaurant has been using Ocean Wise ingredients but only just recently that it has officially signed on as an Ocean Wise partner. 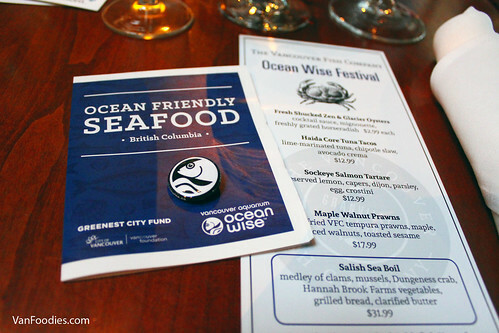 And to celebrate, it’s running its first ever Ocean Wise Festival and I was invited for a tasting of the menu. Not all festival menu items are new; some are simply customer favourites that they want to highlight during this time. First up, Fresh Shucked Zen & Glacier Oysters. According to the restaurant, Zen & Glacier are two lesser used varieties farmed in BC, and they’re more affordable than some more commonly known ones. 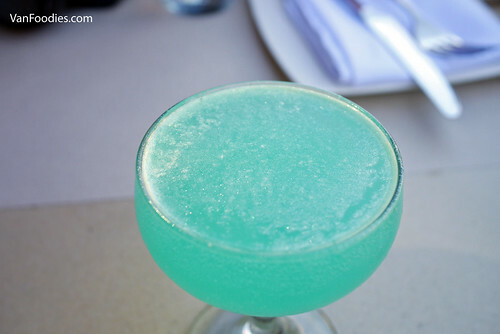 Zen reminded me of Kusshi – thinner flesh, delicate, crisp with a cucumber finish. Glacier, on the other hand, is more plump in shape. 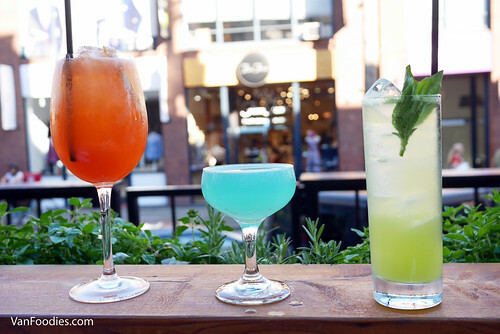 Since our first visit to Edible Canada on Granville Island close to three years ago, it has been added to our list of staple because it has seasonal offerings and quality is consistently good. So for this year’s Dine Out, we decided to go back once again because it had an interesting “Canadian” menu. And we made it a double date with Bryan and Kathryn. 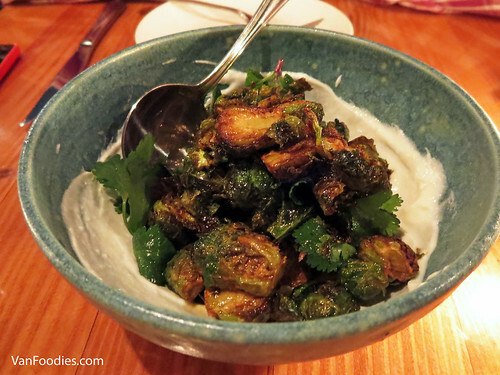 In addition to the regular $30 DOV 3-course menu, you have the option to pay extra to upgrade your dishes. For example, Kathryn and I opted for the Surf and Turf Tartare Trio for an extra $10. It included three types of tartare (from left of photo): Venison, Elk and Arctic Char. I was quite happy with this option. Each tartare had its own flavours – venison was rich, gamey and it was mixed with some blueberries; elk had the resemblance of beef and the tartare reminded of traditional beef tartare with cornichon; arctic char was creamy and was similar to salmon tartare. 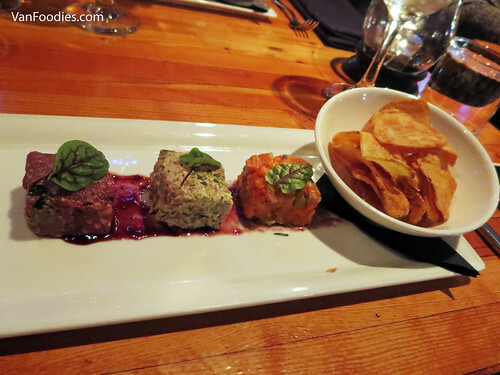 The tartare trio came with the Amola salt truffle chips. They were crispy, nicely seasoned, with lots of truffle aroma. Mr. and Bryan went for a regular appetizer, the Braised Alberta Oxtail. It was rich, moist and tender. 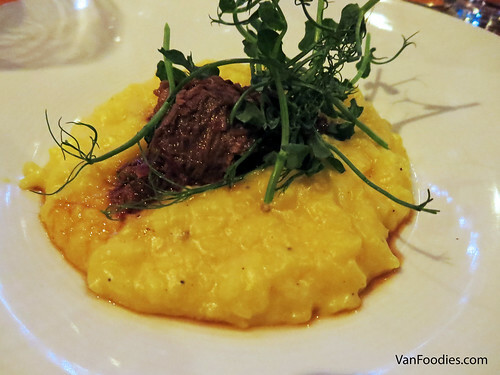 The kubocha squash risotto was slightly overcooked, a bit mushy, and the risotto to meat ratio was a bit off. There was too little oxtail meat, or too much risotto on the plate. Continuing with the meat, Mr. and Kathryn chose the Bison Bourguignon for entree. Now this had a lot of meat! 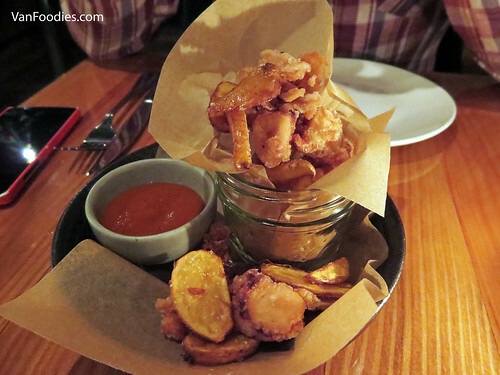 The Fish Shack, along with other members of the Glowbal Restaurant Group, extended their Dine Out menu for a week. With the full intent to try the Fish Shack’s DOVF menu, we ended up ordering off the regular menu, because, the Fishermen’s Catch was calling. For the 4 of us, we created our own seafood feast here. 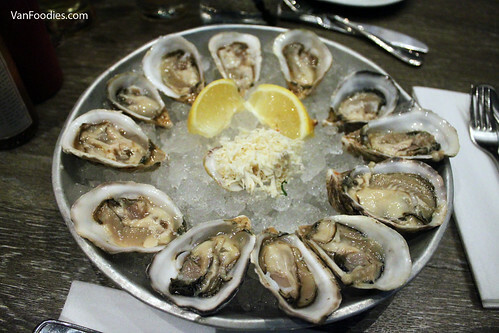 First, a dozen of Kusshi Oysters, my favourite. Fresh oysters here come with 4 sauces: mignonette, cocktail sauce, yuzu and house-made hot sauce. With the exception of the hot sauce, they were all on the light side. Not necessarily a bad thing, since the light sauces added some flavour to the oysters without taking away the taste of the sea. 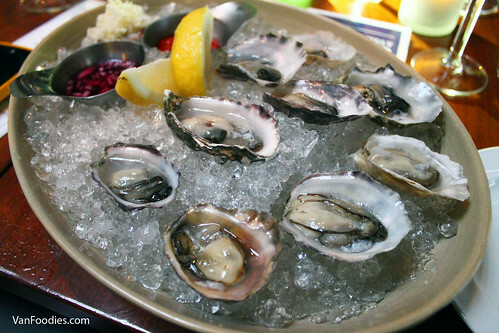 Another good way to eat fresh oysters? Ketchup with a bit of Tabasco. Then, we shared the Small Fishermen’s Catch. You need to order a minimum of two; even though an order of 4 would give us more to share, we wanted to try other things so two orders made more sense. And as expected, the amount of food was probably more appropriate for two people. 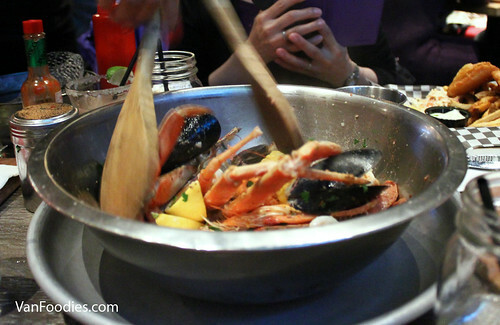 It had a good amount of mussels, clams, calamari, prawns, 2 snow crab legs and half a dungeness crab, as well as corn and chorizo sausages. 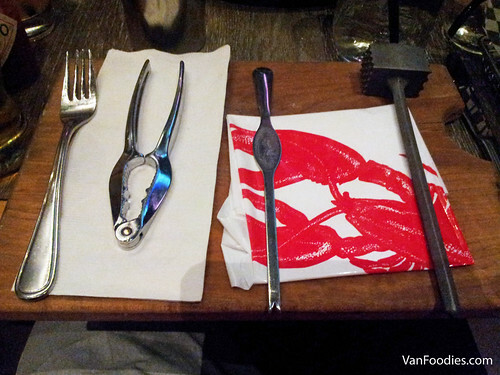 It definitely reminded us of Crab Pot, but the tools here were much more refined than the wooden mallet at Crab Pot. As the seafood boil arrived, the server helped toss some seasoning and butter into the seafood. The seasoning is quite light, so I would suggest to be slightly less conservative with the seasoning shake. 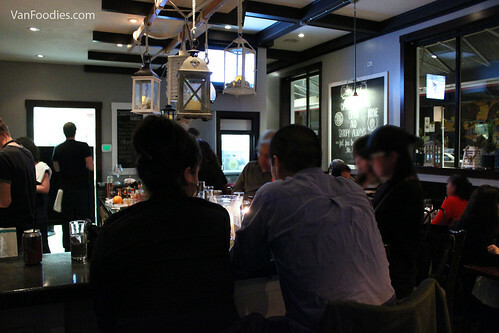 My final Dine Out this year was at Merchants Oyster Bar on Commercial Drive. What caught my eyes was its decision to offer 3 savoury courses instead of the traditional 2 savoury + dessert combination. Mr. and I had a double date with NS and RD. When we got there, we realized they were offering more than what was posted on the DOV website. 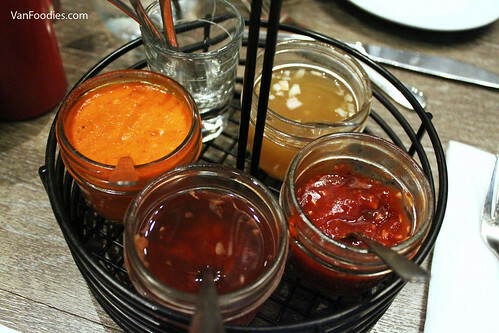 In addition to the 3-savoury course option, we could also choose 2 savoury + dessert or 3 savoury + dessert for a different price. There were also more choices for each course for an additional cost. 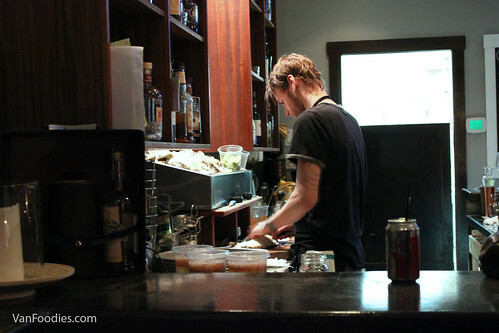 This is actually how they run the restaurant on a day-to-day basis, except it’s usually a daily fresh sheet based on the availability of various ingredients. After much consideration, we stayed with 3 savoury courses but have gone for the new items. For appetizers the four of us each chose something different. My Clam Chowder, which cost an extra $2, was thinner than most other clam chowders I’ve had. It’s not as rich, but in a way I appreciated this preparation. 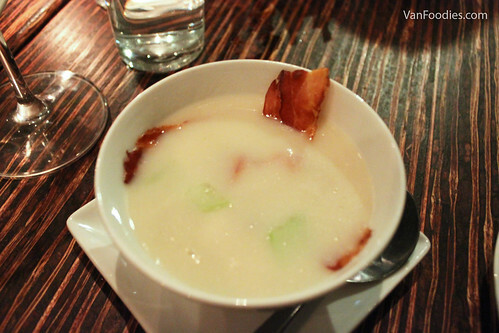 It tasted healthier and fresher with crunchy celery and potato pieces; of course, they had to balance it out with some bacon strips.